TreeLLLe for a society of Life Long Learning, born in 2001, is a legally constituted non-profit association whose aim is to improve quality in education in all its various sectors. 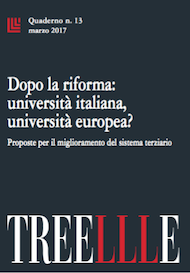 TreeLLLe is a think-tank that through research, analysis and publications offers a service to public opinion, social partners, educational institutions and decision-making authorities, both at national and local levels. Moreover, TreeLLLe undertakes the important task of monitoring education systems and innovation in other countries, and relies on an international network of experts. More specifically, TreeLLLe aims to serve as the "bridge" between the gap which too often separates research, public opinion and decision-makers - a gap which hinders progress in modernizing and improving our educational system. TreeLLLe operates strictly without links to Government or political parties: the uniqueness and ambition of the project lie in harnessing the contribution of well respected personalities and experts who best represent our country's different traditions and cultural identities. Today these traditions and identities need to be brought face-to-face in dialogue within an environment free from everyday political competition and tensions. The Founding Members are guarantors of this commitment. The president is Attilio Oliva, promoter of TreeLLLe and coordinator of its activities and researches. The Forum of the Association - with its Scientific Committee - is composed of well-respected personalities and experts with varied and complementary expertise. TreeLLLe will also call upon eminent advisors (politicians, media editors and representatives from various national and international bodies and institutions) who, however, cannot be held responsible for the thesis and proposals presented by TreeLLLe. Publications are usually signed by TreeLLLe since they result from the work of project groups of national and international experts coordinated by the Association. Each year TreeLLLe will focus on one strategic and wide-ranging theme. Data and analysis on single issues are presented, proposals are put forward, open questions are highlighted, with particular attention to the most successful and innovative international experiences. the proposals are circulated with the aim of informing and involving decision-makers, education authorities and media via public presentations and diffusion of publications. transparent lobbying through the circulation of data, analysis and proposals to decision-makers - both at national and local levels -, parliamentarians, political parties, education boards in order to assure that TreeLLLe proposals influence the Government action and are transformed in actual experiments. TreeLLLe assess the efficacy of its activity by surveying the content of the laws and the measures adopted by decision makers; the number and quality of the experiments undertaken by educational institutions; the acknowledgements of the association's activity by the scientific, political and sectorial communities; the extent of media attention focused on the issues. The analysis and proposals of the researches are presented and discussed in public events with the participation of authorities, experts and operators of the educational system. 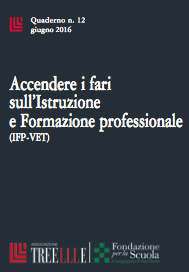 Each research project is published in a specific series ("Quaderni", "Seminari", "Ricerche", "Questioni aperte", etc.) freely distributed ( 5,000 copies per title) on the basis of "targeted" mailing lists (or upon request, within the limits of availability). The documents are also available on TreeLLLe website (www.treellle.org/pubblicazioni). 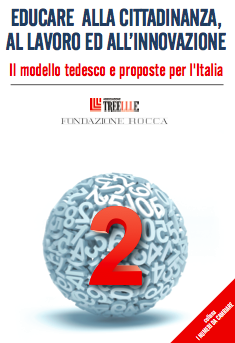 The activity of TreeLLLe is financially supported by some prestigious Italian Foundations set up by leading banks that, in keeping with their institutional purposes, decide to support either single projects or the Association's activity. 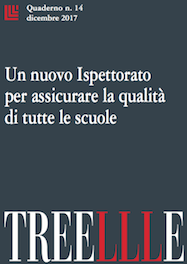 TreeLLLe has received contributions mainly from Compagnia di San Paolo of Torin (and its Fondazione per la Scuola) and from Fondazione Cariplo of Milan, and, on single projects, from the following foundations: Pietro Manodori Cassa di Risparmio di Reggio Emilia, Cassa di Risparmio di Roma, Cassa di Risparmio in Bologna, Monte dei Paschi di Siena, Cassa di Risparmio di Genova e Imperia, Unicredit. Dario Antiseri, Luigi Berlinguer, Carlo Callieri, Maria Grazia Colombo, Carlo Dell'Aringa, Tullio De Mauro, Giuseppe De Rita, Domenico Fisichella, Attilio Oliva, Angelo Panebianco. Luigi Abete, Guido Alpa, Dario Antiseri, Federico Butera, Carlo Callieri, Aldo Casali, Lorenzo Caselli, Elio Catania, Alessandro Cavalli, Innocenzo Cipolletta, Carlo Dell'Aringa, Tullio De Mauro, Giuseppe De Rita, Umberto Eco, Luciano Guerzoni, Mario Lodi, Roberto Maragliano, Angelo Panebianco, Sergio Romano, Domenico Siniscalco, Giuseppe Varchetta, Umberto Veronesi. Tommaso Agasisti, Giulio Anselmi, Ernesto Auci, Guido Barilla, Enzo Carra, Ferruccio De Bortoli, Antonio Di Rosa, Giuliano Ferrara, Domenico Fisichella, Silvio Fortuna, Franco Frattini, Stefania Fuscagni, Lia Ghisani, Lucio Guasti, Ezio Mauro, Mario Mauro, Dario Missaglia, Luciano Modica, Gina Nieri, Andrea Ranieri, Giorgio Rembado, Gian Felice Rocca, Carlo Rossella, Fabio Roversi Monaco, Marcello Sorgi, Piero Tosi, Giovanni Trainito, Giuseppe Valditara, Benedetto Vertecchi, Vincenzo Zani. Fedele Confalonieri, Gian Carlo Lombardi, Luigi Maramotti, Pietro Marzotto, Attilio Oliva, Marco Tronchetti Provera. Secretary of the Board: Guido Alpa. Giuseppe Lombardo (president), Vittorio Afferni, Michele Dassio.